ISLAMISTS' GENOCIDE IN SOMALIA - 30,000 CHILDREN DEAD! Islamists refuse [Western] aid to the famine in Somalia. Thousands perish. Many flee. Al shabaab refuses aid agencies to help the needy Somalis - Shabelle [Jan 12, 2011] MOGADISHU (Sh. M. Network) - Somalia's Al shabaab movement refused international and local aid agencies to reach droughts affected areas in southen and central Somalia to help the needy Somalis, an Al shabaab official said on Wednesday. Sheikh Suldan Mohammed Ala Mohammed, an Al shabaab official, has told local Mogadishu radios that they will never allow aid agencies to operate in the regions under their control. Ala Mohammed charged those aid agencies with having hidden agendas in which they want to propagate and promulgate the Christianity, adding that they also want to launch brain wash attacks against ordinary people of Somalia. Daily Monitor: - World Al-shabaab opposes banned groups from returning to Somalia By Abdulkadir Khalif Posted Saturday, July 23 2011 at 00:00 Radical Somali Islamist group al-Shabaab has said organisations already banned in the war-torn country will not be allowed back. Al-Shabaab spokesman Sheikh Ali Mohamoud Raghe alias Sheikh Ali Dhere, said the said organisations were not welcome to Somali, currently facing severe humanitarian crisis. "The organisations that we banned cannot come back," the spokesman stated Thursday evening. "Such entities are not included among those now invited to provide humanitarian aid," he added, without naming the affected organisations. Sheikh Ali Dhere was reacting to a report by the United Nations on Wednesday that famine had hit two parts of rebel-held Somalia, due to a severe drought affecting more than 10 million people in the Horn of Africa. Islamist group in Somalia bans samosas after deciding they're too Western..' By Stewart Maclean Last updated at 3:28 PM on 26th July 2011 Somalia's al-Shabaab group has banned samosas after ruling the popular snacks are 'offensive' and too Christian. Militant Islamist fighters last week used vehicles mounted with loudspeakers to announce the bizarre ruling across the regions of the war-torn country it controls. The extremist group has offered no official explanation for the ban on the triangular snacks, which are commonly cooked up and served across the Horn of Africa... The bizarre ban comes just days after militants linked to Al-Qaida in Somalia refused to let some aid workers into the country as tens of thousands suffered in the nation's massive famine. Aid groups including the UN Food Programme say they were not given permission by militants to provide aid in the country, where it has been warned that 800,000 children could die from starvation. BBC News - Somali Islamists maintain aid ban and deny famine - Jul 22, 2011 - Somalia's al-Shabab Islamists have denied lifting their ban on some Western aid agencies and say UN reports of famine are "sheer propaganda". The UN on Wednesday said that parts of Somalia were suffering a famine after the worst drought in 60 years. A spokesman for al-Shabab, which has ties to al-Qaeda and controls much of the country, accused the banned groups of being political. One might expect that all Somali leaders and political parties would join forces to help their people survive this enormous tragedy; but one would be wrong. The Somali Muslim terrorists known as al-Shabaab have worked for the past two years to prevent any foreign aid from reaching their Muslim Somali co-religionists, even as tens of thousands of Somali Muslim children die of starvation and hundreds of thousands of starving Muslim families flee al-Shabaab’s reach to find food and water in nearby Kenya and Ethiopia. Harakat ash-Shabaab al-Mujahideen (the "Organization of the Youth Jihad Fighters"), or al-Shabaab ("the lads" or "the youths" in Arabic) for short, is a group of Islamist terrorist jihadis fighting to overthrow the Muslim government of Somalia in order to replace it with a government committed to a more extreme form of Islam and to Shari’a law. The group now controls large swathes of southern Somalia. Its leaders claim that they are waging war against the "enemies of Islam" which includes the present Somali government. Al-Shabaab is an offshoot of Hizbul Islam ("The Islamic Party"), formed to fight the Somali government of President Sheikh Sharif Ahmed. In December, 2010 Hizbul Islam merged with al-Shabaab to better implement jihad against President Ahmed and his government. Al-Shabaab has been designated a terrorist organization by several western governments. Al-Shabaab leaders formerly denied any connection with el-Qaeda, but early in 2010 they acknowledged that they worked with el-Qaeda forces in Pakistan and Yemen for training and deployment. The U.N. and the USA blame al-Shabaab for the famine, because its terrorist forces, under el-Qaeda influence, have created the single greatest obstacle to humanitarian assistance in Somalia. Thanks to al-Shabaab, the rate of malnutrition in southern Somalia is the highest in the world, approaching half the population, according to CNN. In addition to denying aid workers access to the regions where the drought and famine rage, al-Shabaab terrorists force local Somali Muslim humanitarian organizations to pay "taxes" (aka bribes) in order to be able to funnel food and other supplies to the devastated areas. They demand bribes from U.N. and from aid agency officials to allow them to work in areas under al-Shabaab control. In some cases, al-Shabaab terrorists have burned food stocks and medicine, and have kidnapped or killed charity workers, when bribes were not paid. These "taxes" can be as high as $10,000 for access to the areas al-Shabaab controls. Then there are the "registration fees" of another $10,000, and payments of $6,000 every six months, as well as 20 percent of the value of all food and other supplies and 10 percent on all vehicles, as a form of "import duties." Their terrorism pays well; but their extorted wealth and their Islamic jihad agenda come at the expense of the lives of hundreds of thousands, and perhaps millions, of their own people. A gut-wrenching and tragic example of this kind of Islamofascist tyranny is reported in a recent Newsweek magazine interview with a local Somali doctor. Dr. Hawa Abdi is an obstetrician and gynecologist running a clinic near Mogadishu since 1983. Today her medical compound holds 90,000 people, mostly women and children, all homeless refugees fleeing al-Shabaab and the famine. 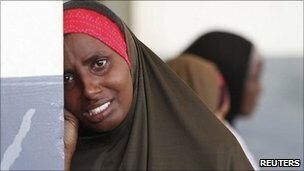 Al-Shabaab’s predecessor, the terrorist group Hizbul Islam, invaded her hospital and camp in 2010 in order to shut her down and take over her property and the hospital, because she is a woman and "…women are not allowed to shoulder any responsibility and authority." She refused even though they threatened to shoot her. They relented and she kept her medical compound and back-yard refugee camp running. This year however, al-Shabaab leaders, now emboldened by their merger with Hizbul Islam, attacked her hospital and home and compound (refuge to 90,000 homeless starving Somali Muslims!) with artillery and automatic weapons, in retaliation for her having been candid in a BBC radio interview about the damage that al-Shabaab has done in Somalia. They targetted the maternity and surgical wards and the pediatric malnutrition center. Hundreds died and thousands more fled, despite their need for medical care, only to die in the Somali desert. This vengeful cruelty becomes utterly unimaginable when one learns that some of these al-Shebaab attackers have their own wives and mothers living as refugees in Dr. Abdi’s compound. Why does al-Shabaab wreck this horrific inhuman brutality against their own Muslim Somali people? As al-Shabaab spokespersons explain it, alien non-Muslim groups cannot be permitted to enter Somalia because they might host spies, or worse, promote an un-Islamic way of life among the Somali Muslims. According to some al-Shabaab representatives, the U.N.’s declaration of famine in parts of Somalia is politically motivated and "pure propaganda;" and attacks on humanitarian workers and the restrictions against the UN and other groups bringing food to starving Somalis are merely self-defense against foreign non-Muslim influences that might corrupt the pure Islamic way of life for Somali Muslims. Al-Shabaab leaders insist that there is no famine. The claims of famine are a hoax, they say, perpetrated by Christians who have an anti-Muslim strategy to transport Somali Muslims abroad, especially into Christian countries like Ethiopia and Kenya, "…so that their faith can be destroyed and they could be staff and soldiers for the Christians." Meanwhile, 30,000 children have died, hundreds of thousands more are malnourished, half-a-million Somali adults are starving, and 1.5 million are homeless; but Somali Islam is kept pure and unsullied by kafir influences. This is conspiracy theory gone ballistic, psychotic mass murder of these terrorists’ own people in order to advance their Muslim jihadist agenda. When the lives of hundreds of thousands of their own Muslim kin mean nothing compared to improving the chances of an al-Shabaab jihad victory in Somalia, we must acknowledge that we are dealing with psychopathic mass murder: Jihad uber Alles. The good news is that Somali government forces have driven al-Shabaab from Somalia’s capitol city, Mogadishu, and have opened the port and roads for UN and USAID supplies and aid workers, at least in the capitol city. Moreover, al-Shabaab may have been weakened both by the government forces’ liberation of Mogadishu and by the blowback of discontent from millions of starving or near-starving Somalis who correctly see al-Shabaab as the cause of their plight. So al-Shebaab’s totalitarian ruthless inhumane treatment of its own Muslim people may now backfire as Somalis suffer mass starvation and hundreds of thousands of deaths caused by al-Shebaab’s blockade and attacks on hospitals and aid workers. Is this a localized Somali tragedy, or should al-Shabaab’s unspeakable cruelty concern the USA? U.S. Rep. Peter T. King (R-NY) has answered that question. On July 27, Rep. King, Chairman of the Committee on Homeland Security, convened a Homeland Security meeting in Washington D.C., entitled "Al Shabaab: Recruitment and Radicalization within the Muslim American Community and the Threat to the Homeland." He said: "Some argue that al-Shabaab is only a Somali problem…(but)…that kind of thinking is a glaring example of what the 9/11 Commission called a failure of imagination." In his presentation, Rep. King documented that Al-Shabaab operatives in the USA and Canada are engaged in an ongoing successful effort to recruit and radicalize young Muslim Somali Americans for jihad. These young Somali Americans are trained by el-Qaeda in Pakistan, and have been deployed in Yemen, Afghanisan, and Somalia. Some of the recruits who joined Al-Shabaab’s terror cadres in Somalia have been killed in the fighting there, and three became suicide bombers. One who quickly rose to the rank of commander in al-Shabaab in Somalia, Mr. Omar Hammami, was raised a Baptist in Alabama! Al-Shabaab in the USA has been far more successful in recruiting Somali American citizens to their terror ranks than has el-Qaeda. Somali Al-Shabaab emissaries recruit actively in mosques in Somali communities all over the USA, with no opposition from local non-Somali imams (though lack of opposition may be out of fear rather than out of support for the al-Shabaab jihad). Federal prosecutions for funding terrorism and recruiting for terrorist groups are the most numerous for Somali-American Muslims than for other Muslim Americans working for other terror organizations. According to Rep. King, these Somali-American Muslim recruits pose a serious threat of home-grown terrorism. "…this threat is real, and …. al-Shabaab leaders’ public calls for attacks against America — including in retaliation for killing bin Laden — must be taken seriously. With a large group of Muslim-Americans willing to die as "martyrs," and a strong operational partnership with al-Qaeda leaders in Pakistan and in Yemen, al-Shabaab now has more capability than ever to strike the U.S. homeland." We must learn from our 9/11 "failure of imagination" and pay close attention to Rep. King’s admonitions. The Somali al-Shabaab display utterly inhuman ruthlessness as they callously condemn hundreds of thousands of their own to death by starvation, in the name of Allah and jihad. Home-grown Somali-American jihadists, trained by al-Qaeda and battle hardened in Somalia and elsewhere, can be expected to treat American kafiroon no less harshly. 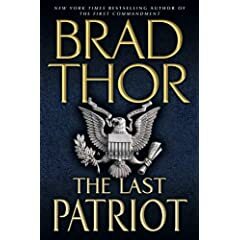 We must connect the dots now, and take pre-emptive defensive action, before al-Shabaab or their ilk perpetrate another 9/11. 1) Condemming Arab Muslim 'Palestinian' parents, teachers, leaders, Mullahs, for using Arab kids as human shields and as human bombs, clarifying the real culprits in Arabs' deaths. 2) Violations by ILLEGAL PA Arabs "settlers" on Israel's "agreed" borders by the UN. 3) "Palestinian" Violation of virtually ALL agreemants pacts with Israel (Oslo, Camp David, etc.). 4) The PA official media & education = hate (crimes) campaign on "the joos", (not just on Israel...). 5) Exposing the constant intimdation on nations by the GOLIATH ARAB MUSLIM (oil) block, to tarnish innocent Israel in the UN. 1) Are you denying that the Arab racist attacks on Jews in Israel/"palestine" has started since 1838 (Safed) [so were the attacks in 1883, 1920, 1921, 1929 - Hebron, etc.]? 2) Had Israel be a (mostly) Arab-Muslim State, would the intolerant Arab-Muslim Goliath world not accept them? 3) Why is there a complete silence on the historical fact of Arab immigration late 1800s early 1900s into Israel/"palestine"? 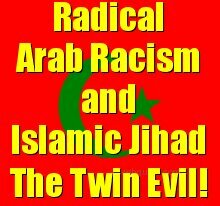 4) What anti-Israel bigotry is stronger, the "Arab racism"; factor? or the 'Islamic-Jihad' factor? 5) 'Moral equivalence' Do you have Arab activists on behalf of Israeli victims, just like you have Jewish, Israeli, Zionists activists for the (so called) 'Palestinian cause' (whatever that is...)? 6) If humane Israel would really go after "unarmed poor palestinians" as the 'Pallwood' propagandists tell us, How many Arabs would have survived Israel's might? 7) Who's more at fault, the Arab Muslim "Palestinians" parents pushing for Shahid-isim, or the indoctrinating Mullahs, Imams in the holy Mosques for using "Palestinian" kids and women as human bombs and as human shields (so they can blame the Zionists when Arab kids die)? 8) What would have happened if Arab Muslim "Palestinians" would have invested as much energy in rebuilding their lives as they do in destroying both nations' lives in fascistic Jihad, total hatred and campaign for GENOCIDE [to "drink the blood of the Jews" or to "push them all to the sea", or to "wipe them off of map"]? 9) Why does "bad" IDF Israeli army announce an area residents' civilians to evacuate before an operation against terrorists? 10) Why did Humane Israel's IDF invented specially low range missiles designed to hit ONLY the [terror] target and minimize collateral damage? 11) When was the last time the "Palestinian" well oil-ed propaganda machine has retracted [or even apologized] for it's usual PALLYWOOD fake images industry? 12) What's the difference between a Christian in Indonesia, Buddhist in Thailand, Christian in Nigeria, in Philippines, Australians in Bali (2002), non Muslims in London (0707/2005), in Madrid (bombing), "not the-right-kind-of-Muslims" in Shiite-Sunni hateful massacres in Iraq, oppression & massacres in the "Islamic Republic of Iran", and Israeli victims of the same "evil ideology"? 13) What's a harder oppression, your "average" Arab Muslim regime's on it's own people, Hamas-tan Islamic Apartheid [which most "Palestinians" supported!] on non Muslims, or the pro-Jihad parents' on their kids? 14) What would have happened if at least ONE Arab Muslim nation [regular or oil-ed one] would really care about the Arab [brothers, that since the 1960's started to call themselves as] "Palestinians" and let them get off the terror slum into normality and even prosperity? 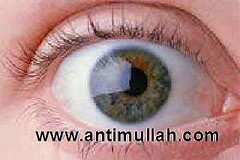 15) What part of 'BLIND FASCISM' do Arab-Muslims deny, the usual obsessed anti Israel demonization [no matter what Israel does] or the reluctance to see Israel's super kind gestures for those that are trying to kill them [releases from prison, giving away own land vital to it's security, humanitarian aid, etc.] not as goodness but as "weakness"? 16) Why is it that when Islamists terrorists [Hamas or Hezbullah, Islamic Jihad, etc.] succeed in making sure Arab kids die [with their known tactics of cowardly firing among or behind children, etc.] the Arabs, Muslims rejoice and the Israelis, Jews are saddened ? 16) How can land be an issue [or the blatant lies the Arab lobby's financed: Jimmy Carter has said, though he admitted that Israel is a great equal democracy for all, Arabs and Jews alike!'] if "moderate" Palestinian official government still has venomous hatred and pro 'death cult' in it's regular curriculum and on it's official TV, or that such "moderate" Arab media outlets [like Al Jazeera] still glorify mass murder as "martyrdom"? 17) Who's more powerful, the Arab Muslim Goliath Oil mafia "lobby" on the world or a Chinese, Italian, Israeli, Irish, pharmaceutical, cigarettes lobbyists in Washington? 18) Had the International Arab Muslim lobby of nations in the UN [or the EU] not threatened other nations to bash Israel 24/7 [motivated by intolerance only! ], What would be then the outcome? Let's make it clear, even if there will be a "Palestine" state, it will never change the factual history, that a group of foreign Arab immigrants came into the (historic) land of the Jews (and started to call themselves as "Palestinians" in the 1960's) and hijacked the world comunity via terrorism and Arab oil power to give them yet a second 'Palestine' state (after Jordan). Most Muslims have "theories" about 9/11 Islamists' massacre. 99.99% of Muslims that "denounce" [if at all] Islamic terror massacres on non Muslims, imply the word "but". Most Arabs are so racist, most Muslims are so intolerant, they just can't bring themselves to be grateful to the US for rescuing Iraqi Arab men, women & children from the butcher & torturer of Baghdad: Saddam Hussein. There was not one shred of gratitude from any known Muslim leader or group for US & Europe's rescuing of Bosnian Muslims in the 1990's. There was not one declaration of thank you from any known Muslim leader or organization for US saving of Somali Muslims in the 1990's. Virtually all of the minorities are persecuted in the entire Muslim world: Christians, Druze, Kurds, Ahwazi Arabs, Marsh Arabs, Jews, Berbers, non-Arab Africans in the Sudan [by racist Arab militias in cooperation with Sudanese Islamic government], non-Arab Africans in Mauritania, Nubians, Copts, Assyrians, Maronites, Chinese in Indonesia, etc. Did one [mainstream] single Muslim cleric come up and say that the Koranic term [reminder, only Islamists kill, torture in the name of religion & book] 'apes & pigs', the Islamists call the non Muslims, are not to be followed? While [not only most Jews or even most Israelis, but even] most Zionist Jews sympathize with Arab 'Palestinian' fallen unintentionally in the war on terror, almost all Arabs & Muslims demonize Israeli victims of intentional Arab-Muslims violent crimes against humanity. While Arabs live in Israel not only just better & more free [women voting, real free speech, etc.] than in all of their own regimes, but treated often as first class citizens ahead of Israeli Jews (courts, land issues, etc. ), Jews, however, are either not allowed to live in certain Arab countries [apartheid, ethnic cleansing, etc. Syria even denies any entry for a Jew,] or persecuted in most Arab countries. Which Arab Muslim nation is exempt of the epidemic of criminal 'honor killing'? 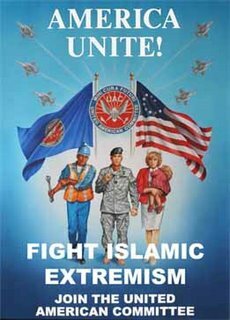 If Pro terror Muslim organizations like CAIR [ http://anti-cair-net.org ] is defined as "moderate", what would one call their mainstream? Roughly 90% of Arabs polled, have a negative view on all Jews [not just being 'anti-Zionism', whatever that means], even in such [so called 'moderate'] countries like: Jordan. "White" Hitler's 'MeinKampf' is translated into Arabic, available on the "brown" Arab market, what for? What's the interest in "brown" Arab nations' inviting "white" KKK members to speak? 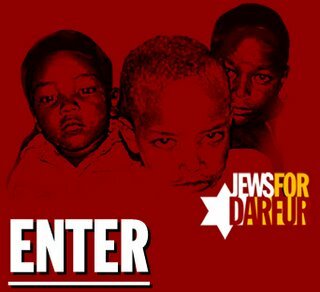 Do you know of any Muslim group that has joined the efforts of Christian/Jewish action to prevent the racist genocide by Arab Muslims in Sudan upon native black Muslims? Has any Arab media issued an apology for inciting the bloody "intifada"  via lying images, such as of Muhammad Al dura, which as we all know by now, was killed by Arabs themselves [who knows how many more]? or has anyone of them run the true version of stories? Which Arab, Muslim nation is exempt from the crime of libel against Israel's struggle for survival with outrageous drama "accusations" & horrific twisted around definitions in the UN [reaching it's peak with their racist resolution in Durban - 2000, hypocritically calling it "against racism"]? How many Arabs, Muslims, have declared openly that the 'Palestinian' Arab Muslim cult of using it's kids as human bombs and as human shields in their war against Israeli civilians, is totally immoral? Not one Muslim group has come up against and declared that a collective boycott of an entire nation such as Denmark (2006, because they were upset with a few cartoonists that happened to be Danes) is racism. While most Arab, most Muslims couldn't care less what happens with the [so called] "Palestinian" Arab Muslims, they do use them as pawns in their fascist war [physical, propaganda, economic & in the UN] against the non Arab, non Muslim "island" in their neighborhood, i.e. Israel. While Arab, Muslims leaders chased out, in 1948, most of the [so called] "Palestinian" refugees, with bragging "promises" of "victory" & ethnic cleansing the Jews out of Israel, they put them in camps, never let Israel to improve their conditions, so to use them as pawns in their fascist war against the non Arab, non Muslim "island" in their neighborhood, i.e. Israel. Most Arab Muslim media draws Israel so vile, as in the WWII type of Nazi cartoon drive [the other unfunny ironic part is, they pick the non-Zionist Jew image, hypocrisy, again, fascism, again]. 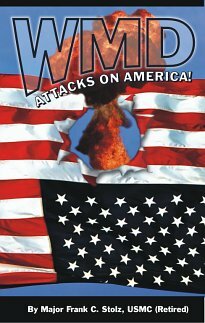 Most Muslims wishwash the facsistic Muslims' torture and cold blooded murder of innocent people that just happened to be Jewish, like: Daniel Pearl, Nick Berg, Ilan Halimi. 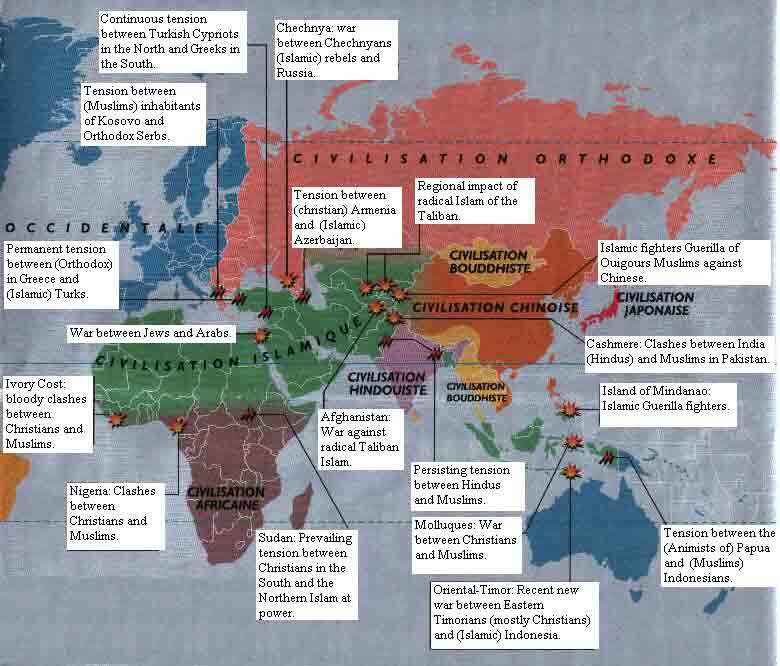 Exactly How many Muslims or Muslim organizations [that are so worry about their image or of their 'prophet's] have protested against the masses of Muslims on the 'Cartoon -Jihad' rampage (2006), calling Europe a cancer and threatening a "9/11" on Europe? 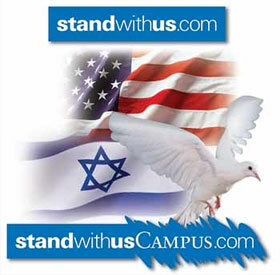 Not one of the few courageous Muslims that speak out for real overall reform, for disliking westerners, for sympathy for Israel the victim, for about [all] Muslims regimes' crimes on their own people, have been shielded from any major Muslim organization (including such as CAIR - http://anti-cair-net.org), from the menace of death threats Fatwas by Muslim clerics.